only waves in the sea. 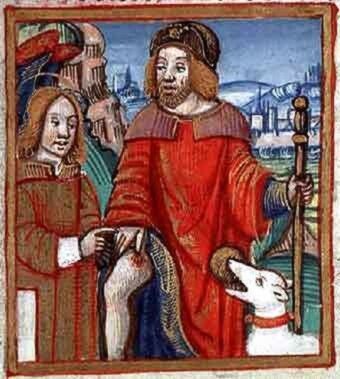 According to his Acta and his vita in Legenda Aurea, Saint Roch was born at Montpellier, at that time “upon the border of France” as Legenda Aurea has it, the son of the noble governor of that city. On the death of his parents in his twentieth year he distributed all his worldly goods among the poor like Francis of Assisi”” though his father on his deathbed had ordained him governor of Montpellier”” and set out as a mendicant pilgrim for Rome. Ministering at Piacenza he himself finally fell ill. He was expelled from the town; and withdrew into the forest, where he made himself a hut of boughs and leaves, which was miraculously supplied with water by a spring that arose in the place; he would have perished had not a dog supplied him with bread and licked his wounds, healing them.